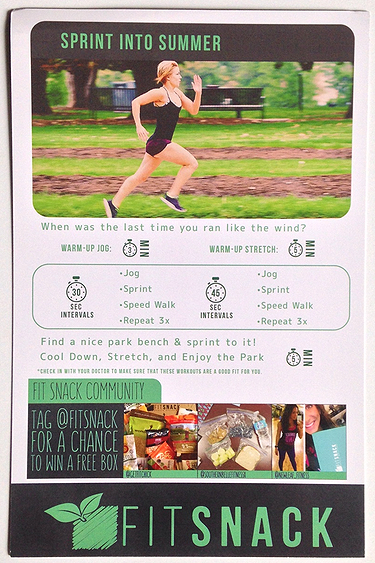 June 2015 Fit Snack Unboxing + Free Gym Bag! Happy Friday everyone! Today I will be sharing my June Fit Snack with you all! 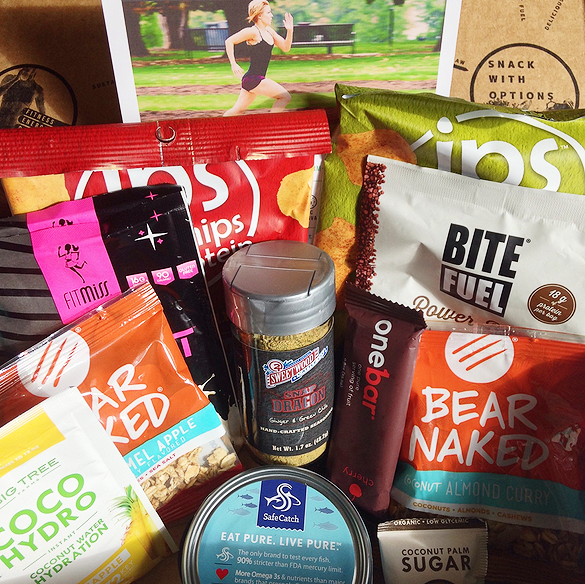 Fit Snack is a monthly subscription service that sends out fitness tips and 6-9 delicious snacks straight to your doorstep. They are committed to provide nutritious snacks that compliment any diet. 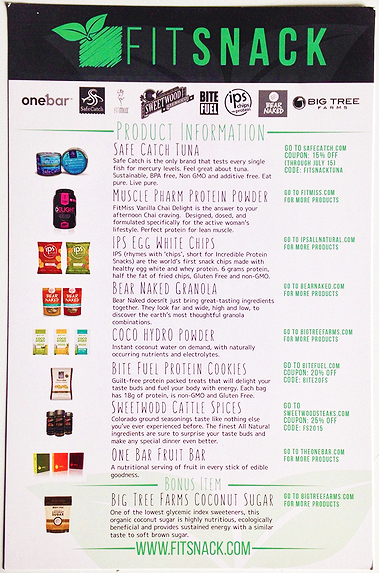 Additionally, Fit Snack focuses on a combination of the “Perfect 10”: High Protein | Complex Carbs | Low Sugar | GMO-Free | Paleo | Gluten Free | Clean Eating | Sustainable | Organic | Raw. You can read more about them here! How Much Does Fit Snack Cost? 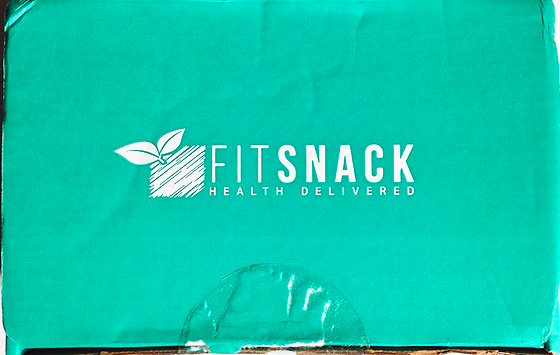 Fit Snack costs $17.90 a month + $6 shipping for US subscribers (shipping costs are higher for international subscribers) and they do have slightly cheaper plans if you purchase a 3, 6, or 12 month subscription! 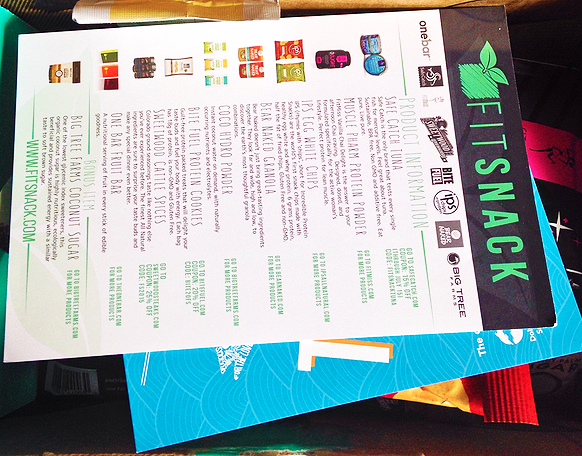 Each box comes with an information card listing all the delicious goodies sent in the box! The back side of this card has a workout plan and this month’s theme is “Spring Into Summer”. 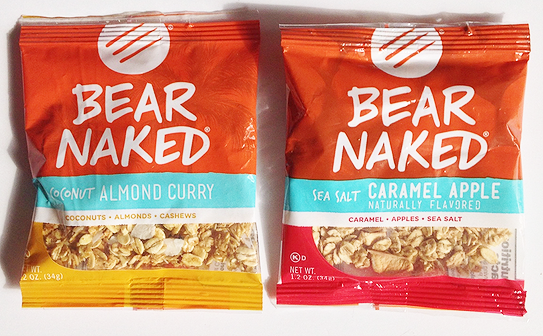 The first is a mix of coconuts, almonds, cashews, and spicy eastern curry while the second bag is full of caramel, sea salt, and apple goodness. I think these will be perfect to punch on in class or at work! I’m not sure how I will like the first bag but the sea salt caramel apple sounds delicious! Some of the other flavors sound delicious, I’m tempted to try Triple Berry! Big Tree Farms Coconut Sugar – Bonus Item! 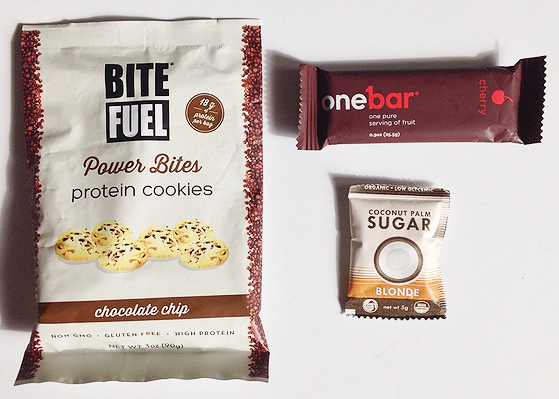 The protein cookies were in a sneak preview and I was super excited to try these out! This bag has 6 cookies and includes 18 grams of protein, is non GMO and gluten free! I honestly had no expectations of this, I was just hoping the cookies were soft. Unfortunately for me, these were a bit hard but they were still delicious! The One Bar is equivalent to a one serving of fruit and is gluten free and vegan. Although the label says it’s cherry flavored, the ingredients include dried pears and apples. It was super delicious but I’m not sure if I would purchase a whole box of these..I’ll have to wait and see. The sugar packet is a bonus item and is one of the lowest glycemic index sweeteners. It’s organic coconut sugar and provides sustained energy. 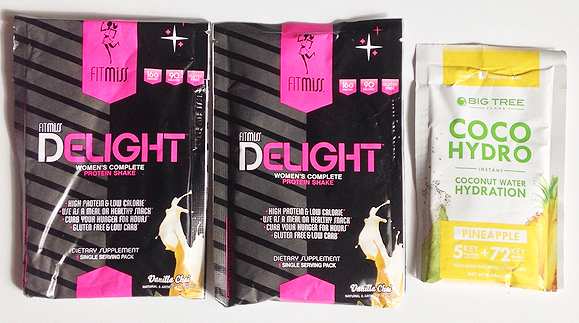 These protein powders are high in protein (obviously) and gluten free! I’m not a huge fan of anything chai flavored so I’m not sure if I’ll be giving these a go. The Coco Hydro isn’t listed on the information card but it’s basically a powder that turns your water into coconut water! I’m really interested in trying this out, it’ll be perfect for one of those hot summer days! I think these two were hands down my favorite foods in this box! 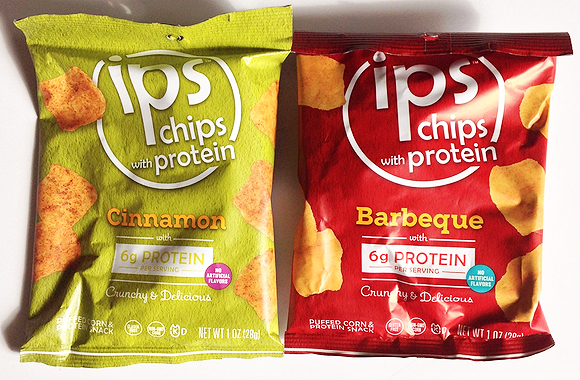 Fit Snack totally nailed it with the flavors because the cinnamon reminded me of those cinnamon twists Taco Bell used to sell and I’m on a huge barbeque frenzie so anything barbeque flavored is heaven sent. Sweetwood Cattle Spices are ground in Colorado and the ingredients of these include green chile, ginger, garlic, cumin, celery salt, oregano, and salt. 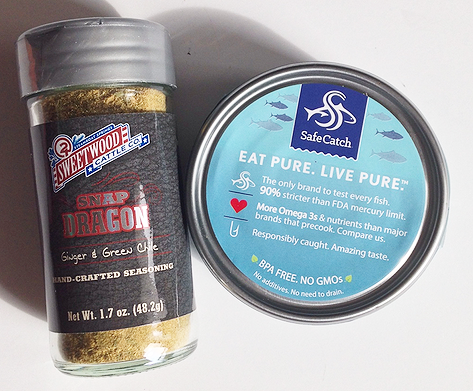 Safe Catch is the only brand that tests every fish for mercury levels and is BPA free, non GMO and additive free. I don’t eat tuna so I will be handing this off to a friend. This isn’t my favorite box but I did enjoy most of what was included! I think the only things I probably won’t use are the tuna and protein powders. I do think it’s a fair value for $23 since everything is made from quality ingredients, what do you all think? I feel like this box may be a hit or miss depending on personal preferences. I really appreciate the different types of products they include in every box and the variety of flavors! If you like healthy snacking and are searching for new goodies to try then Fit Snack is definitely worth a try! If you use my link to subscribe you will get a free gym bag with your first box! *I received this item in exchange for my honest, unbiased opinion. All opinions expressed are my own and I would not promote an item if I did not think it would spark interest to my readers. This post may contain affiliate links. The CoCo Hydro sounds really cool! I love coconut water but buying the single serve bottles for $3+ a bottle is crazy so I rarely do. I'll have to see how much thise packets cost. Great overview of another neat box!